Want new energy, enthusiasm, and humor in your healthcare career? How to rekindle your passion and enjoyment in your healthcare calling. How to find time to care for yourself & your family first. In short, results. Some of our prescriptions are free, some cost. All work. Fill your prescription today. 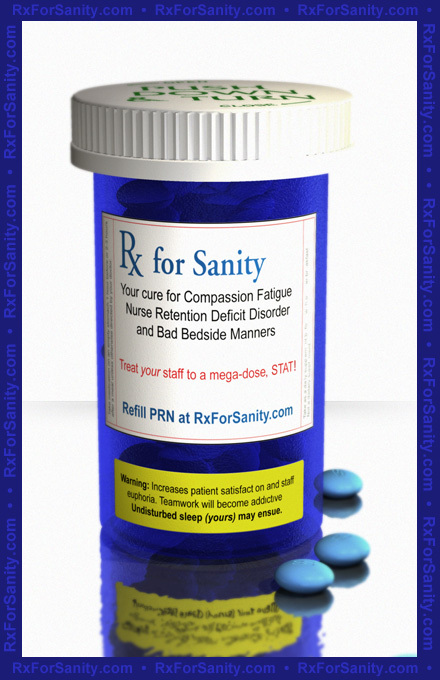 Take your Rx For Sanity! Whose fault is it when your nursing staff leaves? Frankly, it’s often yours (and I’m reasonably certain that you’re a nice person…). You didn’t see it coming, but it’s often subtle. You didn’t perceive the lack of bounce in a step or smile in the eyes of your staff. The progressively shabby teamwork. A physician no one wants to work with. Look around you. Do you provide your staff the tools and techniques they need to restore their passion for their career? How much is ‘staff burnout’ costing your hospital? The American Hospital Association estimates the cost of replacing one staff nurse equals the annual salary for that nurse. At a median annual salary of $65,000 per RN, it adds up to an expensive problem for your hospital, and your patients. What’s your staff vacancy rate? How much are agency nurses and overtime costing you? When magnet hospitals decide to ensure staff retention, this is what they do. Magnet designation focuses promoting quality care in a milieu that supports professional practice. Is your hospital happy and healthy? Have you taken the temperature of your milieu? Is all well, or are there some vague unhappy rumblings? It’s your choice: $65,000 to recruit & train a new nurse, or retain the great staff you’ve got. Poke through our website, and think about your staff’s needs. Don’t apply a temporary tourniquet to your staff’s dis-ease; together let’s cure your hospital’s issues. Call me or email, and we’ll talk about how I may be of service to you and to organization!